Please give me a history on the Garden? Okay, love. Long ago there was this guild called the Brotherhood of the Hand. They were somewhere between neutral and evil. This lovely lass named Desiree Noire decided to host a tavern primarily for the Brotherhood. I was one of their majors then. I have since retired from the military. Lord Baeleron asked me to host a bawdy story contest every Sunday night at this tavern. When Desiree Noire chose to pass the tavern on, I was chosen. 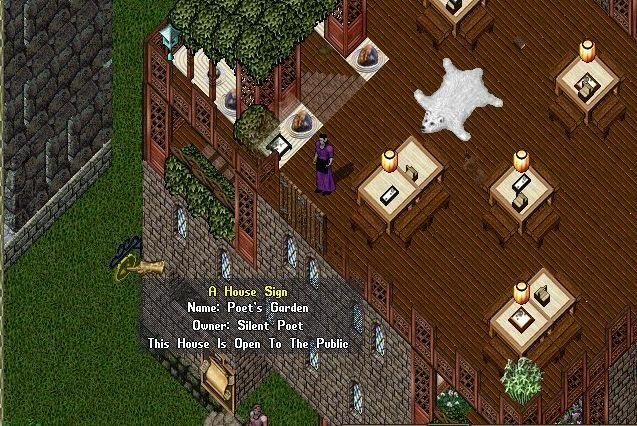 What made you decide to run a tavern in Sosaria? The one thing I do best in life, me poppet, is that I am a Village Idiot, or Minstrel. Sometimes it is hard to tell the difference. I have always been the jester. It is the audience’s choice if I make them laugh or not. I had originally tried to host a tavern in Mistas. What makes this establishment unique compared to others? Well, it has me for one. I mean, I throw a good party. Three pitchers for everyone every ten minutes until someone passes out. Then four. Tell me some of the events you host here? The Traveling Minstrels, my guild, have hosted many events there. We have performed everything from a wedding to a compassion play. We limit our performances to our audience. How did Poet come into possession of the tavern? The original owner of the Garden of Sin and Desire was DeSiree Noire. She is the mother of one of my children. She decided that this path was not meant for her and left the realm. In her will I acquired the Garden. Do the Traveling Minstrels still perform here? We do still perform here. Our crowds have thinned somewhat through the years, however, we have always been open. Except for the time when it was blown up. Can you tell me about their history a bit? The Minstrels have maintained and run this tavern for almost 4 years by our clock, I am not sure how many that is by the UO clock. The Minstrels were created when the Brotherhood folded. I chose to return to my roots as a busker, a performer. I get more attention being the village idiot savant. How long have the Minstrels been around? We are nearing our 4th year in game the 28th of this month. An event will be held on the 30th to celebrate this event. If I were a visitor to the Garden what would I expect to see? Well, love … that would really depend on the night. However, if someone were to make reservations, we could recreate the most decadent carnivales … within decent standards that the patron would like. We choose to entertain. Can you tell me anything else about the Garden or the Minstrels that you have not had a chance to? It has been destroyed twice. One time it was burned by pirates and I rebuilt. One time I sort of blew it up. I rebuilt. The Poet’s Garden is in Malas at: 72o15’N; 40o13’E. Please stop by any night to see what’s going on and share in some of the fun!